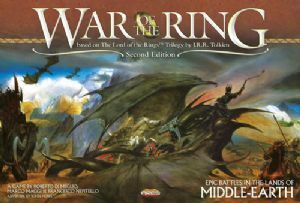 The War of the Ring is a game for two to four players, based on J.R.R. Tolkien’s The Lord of the Rings™. The players take part in the struggle of the armies of the Free Peoples and the heroic Companions of the Fellowship of the Ring against the dark host of the Shadow and the powerful Minions of the Dark Lord. In a two-player game, each opponent will lead either the Free Peoples or the armies of the Shadow, while in a three- or four-players game, the players will be organized in two team, each team controlling either faction. In each game of War of the Ring, the player controlling the Shadow attempts to use his superior military power to conquer Middle-earth. At his command gather Sauron’s legions of Orcs and Trolls, the forces of the wizard Saruman, and the hosts of the Southrons and Easterlings, set to bring darkness over the West. Controlled by the Free Peoples player, the Fellowship is his true chance of winning, as the military forces of the Shadow will be vanquished together with their master if the Ring is undone. But the Quest is fraught with ever greater perils, as the Darkness falls over Middle-earth… In the end, one side will emerge victorious.